When the 'Look in' property is set to 'All Script Windows' in E-Studio's Find and Replace dialog and you are editing a non-certified package file in the PackageFile Editor, E-Prime only opens the next script window and fails to find the next instance of the requested phrase. While editing a non-certified package file in the PackageFile Editor program, you are able to search for any phrase or character by simply pressing CTRL+F. This Find and Replace dialogue has been updated for the E-Prime 2.0 Production Release (version 2.0.10.242) to include a property called 'Look in'. This property is meant to specify whether E-Prime should search the current script window or the entire experiment for the requested phrase. 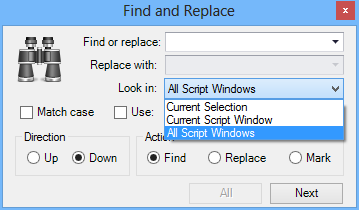 The Professional edition includes the 'All Script Windows' setting, which should search all of the script for the requested phrase. However, if you are using the E-Prime 2.0 Production Release and editing a non-certified package file, this function will simply open the next InLine object or script window and will not search for the requested phrase. This has been corrected in E-Prime 2.0 SP1 (version 2.0.10.353) when editing a certified package file in the PackageFile Editor, or when working in E-Studio.